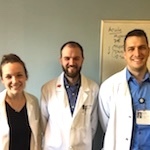 The three alumni, all at different stages of their medical education, have met at UPMC as an attending, intern, and medical student. As fate would have it they all ended up on the same medical team at the same hospital. Alyce Anderson graduated in 2010 with a bachelor’s degree and majors in biochemistry and nutritional sciences. The native of Seymour, Wis. knew she wanted to come to UW–Madison to study biochemistry because it would help her pre-medicine track. She says it was great preparation for medical school and research. Department of Biochemistry at @UWBiochem. After a gap year working at the Wisconsin Alzheimer’s Disease Research Center she joined the eight-year-long M.D/Ph.D. program at the University of Pittsburgh to pursue their clinical and translational science degree. With a Ph.D. in hand she’s now in her final year of medical school. Brent Thiel, who graduated in 2008, and Anderson knew each other through the Undergraduate Biochemistry Student Organization (USBO), which is now a student chapter of the American Society for Biochemistry and Molecular Biology (ASBMB). Daniel Huettner graduated in 2012 with a bachelor’s degree with a major in biochemistry and certificate in African Studies, which culminated in studying abroad in Cape Town, South Africa. studying abroad as a student at UW–Madison. Huettner worked in Madison for AmeriCorps for a year before attending medical school at Drexel University. He’s currently a second-year resident at UPMC in anesthesiology. He says his education in biochemistry came in handy for research on Parkinson’s disease he conducted in medical school and that he’s able to grasp concepts in anesthesiology more easily. His list of things he misses about UW–Madison goes on and on: the Terrace, gamedays, the lakes, Lakeshore Path, State Street, concerts, and learning to sail with Hoofers. His time as an undergraduate researcher in the lab of biomolecular chemistry professor David Brow was pivotal in fostering his interest in research, he adds.